Red Velvet Crinkle Cookies are still another red treat that shows my love of red these days. We’re welcoming the month of red and pink right? So I’m not sure if this will be the last one. You will probably see some more red recipes here. Red Velvet treats are so pupular around Valentine’s Day, so you might want to see our Classic Red Velvet Cake and Red Velvet Chocolate Chip Cookies before you plan your special day. 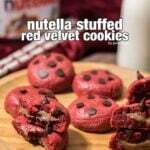 The idea of making these red velvet crinkle cookies came out when I was making the red velvet chocolate chip cookies. While I was making the cookie balls, I thought it would be a nice addition to add some chocolate inside the cookie dough, so I used 1 tablespoon melted chocolate Nutella. Wow! The result is amazing! I will use more chocolate next time to see if I can make these even more chocolaty. The more chocolate, the better. These are super moist inside. Just get a bite and have a look at the remaining piece, you will fall in love with it. I combined all-purpose flour and cocoa powder in the recipe, so my cookies don’t look too red, that’s how I like them. You can arrange the tone of the color red yourself. You can add more food coloring after you combine everything if you like it redder. You might need a little more flour then. Or you can just reduce the amount of cocoa powder and add more flour instead to have a redder look. I would say these red velvet crinkle cookies make perfect gifts but I’m not sure if you would want to share them with others. They are that addictive! You will agree with me when you make these. So you might even want to double the recipe. These cookies are chewy outside and moist inside. Melted chocolate is added in these and you will love it. Mix butter and sugar with an electric mixer or with a spatula until creamy. Beat egg in another bowl and add it into the mixture. Add in milk, melted chocolate or nutella, vanilla and red food coloring. Mix well. Combine flour, cocoa powder, salt, baking soda in a separate bowl and gradually add in the butter mixture. Chill the dough at least for 1 hour. Preheat oven to 350F (180C). Line two baking sheets with parchment paper and set aside. Scoop out 1 tablespoon of dough and make it a ball. Put 1 cup powdered sugar in a bowl and roll the cookie ball into the powdered sugar. Coat it well with powdered sugar. Place on the parchment paper. Bake for 11 minutes. Remove from oven and wait on the baking sheets for 5 minutes. Then let them cool completely on a wire rack. 1. I gently pressed on some of them with my two fingers to give them a flat look. You can do the same or just leave them as they are.[br][br]2. The powdered sugar I used to coat the cookies almost melted, so I sifted some more after they partly cooled. hi, making these now, when does the milk go in? Add it right after the egg. I’ve just corrected the recipe. The color of these is so beautiful and I’m sure they taste amazing! I love red velvet! Thank you Eden for these nice words! 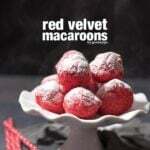 I love red velvet too and these cookies taste really yummy!